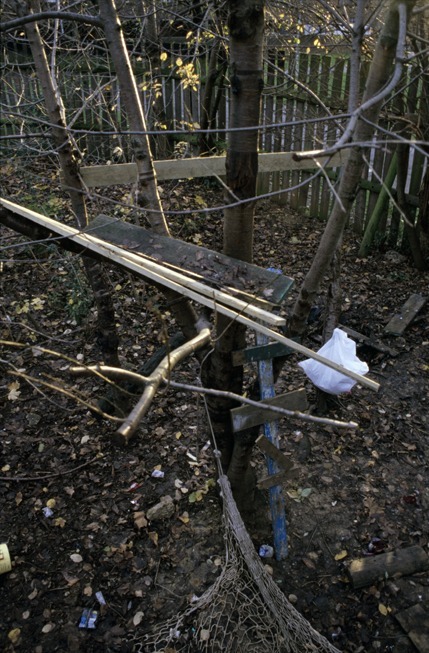 Crumbles Castle Adventure Playground was built in 1970 by a group of local residents with help from architecture students. Called Crumbles because of the crumbling housing estate that was there before, the "castle" is the main office and activity centre and has been designed so that the roof is also part of the playscape. The tower is called "the mushroom" and hides a metal chimney. Unusually for a London adventure playground it has a wood yard and a tool bank for kids to use and build structures with. Close consultation with children on designs and structure building is essential to the character of this imaginative and popular playground. It also has larger "wild" areas and it harvests its own rainwater. Last visited and photographed in 2003.